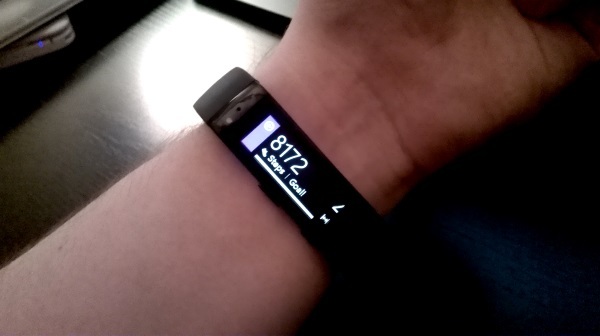 I have now had the Microsoft Band for one week, and it actually feels like I’ve had it for longer. This is usually a very good sign for any new technology, and I thought I’d share my experiences so far. This isn’t a review as such, this is just my findings on how the Band fits into my lifestyle right now. First of all, I got the large version of the Band. When it’s at its tightest fitting it’s very snug on my wrist. This gives me a little extra room to loosen it up if I wish, however I find that it’s perfectly comfortable when nice and tight. After a long session of exercise my skin tends to be more sensitive in general, and I notice the device more. This is no different to how I used my G-Shock, and in fact I’d go so far as to say that I notice it about as much. The times I really notice it most are when the rubber catches on the sleeve of my shirt, or I forget that I’m wearing it and I put my hand in a drawer or a bag and knock the device. This is no different to wearing a large watch really, so I’m not complaining, but this is a large device and I do notice it throughout the day – just like my G-Shock. Talking of my G-Shock, I’ve decided to wear my Band on my left wrist in the position that used to be reserved for my favourite timepiece. The difference here is that the screen is on the inside. This is by far the best position for the screen when checking your heart rate or time elapsed when doing any kind of exercise, and was the correct decision for a fitness-focussed device like this. As well as replacing my watch, the Band has also replaced my Fitbit. I used my Fitbit One to passively track statistics like steps throughout the day. The Band does this and seems to have approximately the same accuracy as the Fitbit. I only have these two devices to compare against each other, and the Fitbit seems to be consistently higher by a couple of hundred steps every day – this may be a false tracking of car journeys. I’m not sure. The Band also supports more active statistics like actual exercise. This is one of the things I used to do though MSN Health & Fitness on my Windows phone. Now I don’t even need to take my phone on my run, and I still get even better statistics than I did before. Effectively, the Band has replaced two hardware devices I always carried and two apps I always used for tracking exercise. As well as running (hiking and walking) you can also track other more generic exercise workouts. This is great for recording time, calories and heart rate for strength workouts, or anything where you’re not running. At the moment, there’s no specific exercise tracking mode for things like cycling. This isn’t something I’m doing right now, so I’m not too bothered. However, the Microsoft Health software offers a number of guided workouts which can be selected to help you exercise over multiple days. Currently I’m using a 5K training workout which uses interval running to get up to a 5K run in 14 days. And here we get to the really important part. 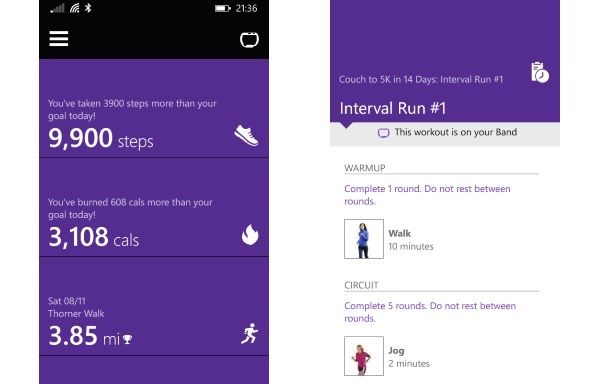 The Microsoft Health software is new. Very new. Probably so new it lacks features that I’ve come to expect – for example there is no way of viewing my statistics online without using the app. In time this will change and Microsoft Health will support more exercises, better ways to access the data, synchronisation with HealthVault and much more. In many ways the Microsoft Band is just a way for Microsoft to get data into their new health platform, and Band 2.0 will no doubt be out before too long. Finally, to prove that the software is lacking features, I haven’t yet found a way to use the galvanic skin response or skin temperature sensors. They are in the hardware, but there is no way to access the data through the software. Yet. So far my experience has been very positive and I’m looking forward to seeing what comes from unlocking the Band hardware and expanding the Health software in the near future. Great review, looking forward to hearing about how the software improves. Hopefully the Band gets a proper release in the UK as it is without doubt the most ambitious fitness tracking product currently on the market. 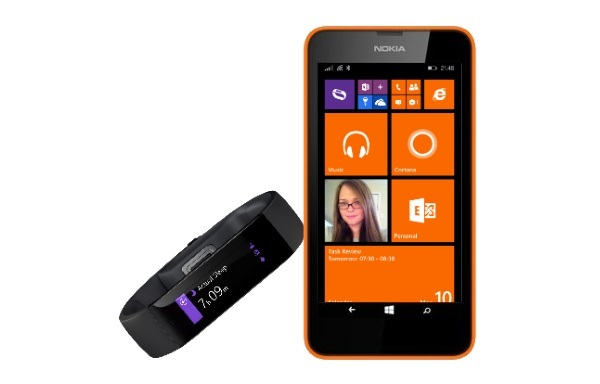 The idea of having Cortana on your wrist would bring me back to WindowsPhone in a heart beat.